“I know that place,” I said to my friend, gesturing to the framed photo on her living room wall. It was a mid-summer’s evening, and we had just come inside to prep dinner for a backyard barbecue at her Toronto home. “It’s Kakabeka Falls, isn’t it?” I asked. She told me she wasn’t sure, that she and her boyfriend had bought the picture at some garage sale years ago, but hadn’t looked into where the image had originated. They had just liked it enough to hang the image of cascading falls in their apartment. That exchange sort of sums up what Kakabeka Falls Provincial Park is all about—it’s spectacular enough that it warrants framed photos and artwork (in fact, the most famous painting of Kakabeka Falls, by landscape artist Lucius R. O’Brien, resides at the National Gallery of Canada), but it’s also hidden enough to most Southern Ontarians that you could see an image of it and not even realize you were looking at your own province. And then, even once you’ve found Kakabeka, it still holds myths and mysteries within its waters. 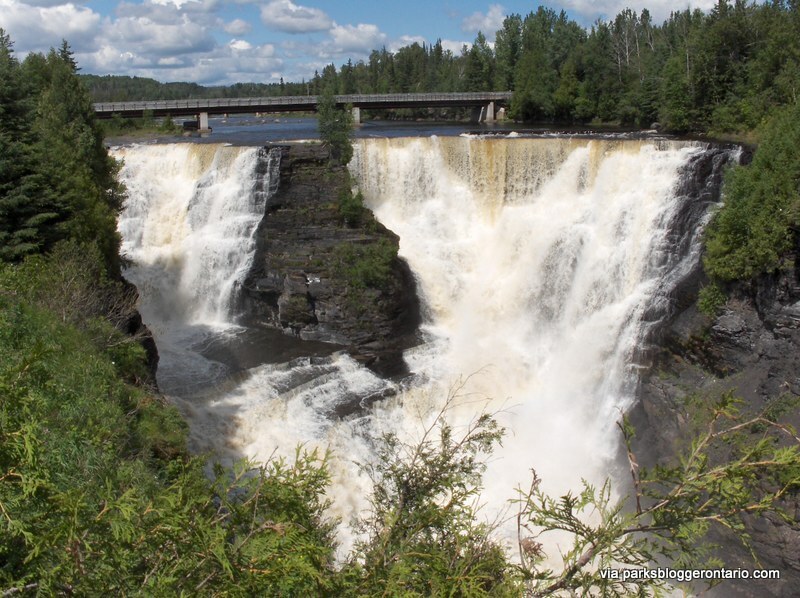 I discovered Kakabeka Falls on a camping road trip through Northern Ontario that took me from Toronto up to Blue Lake, not far from the Manitoba border. Kakabeka was a pit stop on the TransCanada Highway near Thunder Bay, between the better-known Lake Superior and Sleeping Giant provincial parks. 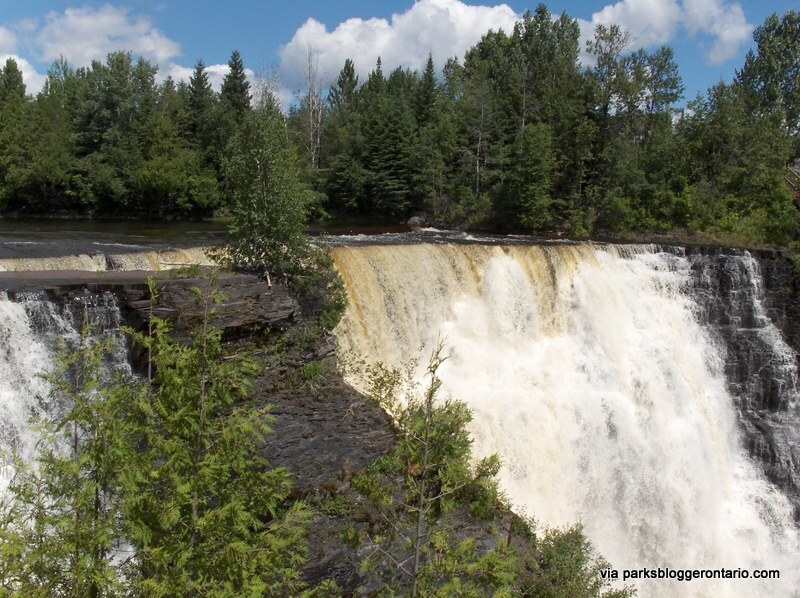 I had read about the falls while researching my route, and was surprised to learn that 40-metre-high Kakabeka is the second highest waterfall in Ontario, ranking only behind the massively famous Niagara Falls (Niagara boasts a height of 51 metres). As such, it’s no surprise that Kakabeka is dubbed the “Niagara of the North,” and its power is visible to visitors from a pedestrian bridge and multiple viewing platforms. 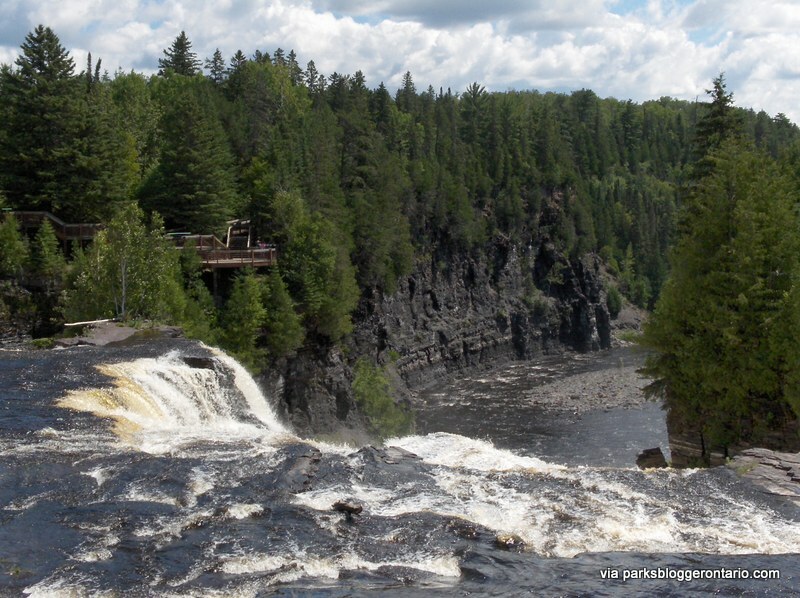 But beyond its height and beauty, Kakabeka is also a geological wonder—the Kaministiquia River has cut through the rocks, revealing fossils at the foot of the falls that date back 1.6 million years. These fossils are stromatolites—layers of microorganisms trapped and cemented within the rock. Stromatolites are considered the oldest fossils in the world, and when the ones at Kakabeka were discovered back in 1965, they not only offered a glimpse into prehistoric Northern Ontario, but they also raised as many questions as they answered: at the time, the stromatolites looked unlike any other known micro-organism. Since then, studies have uncovered Kakabeka’s unique organism in soil samples from around the globe, but its Ontario roots stand proud—the newly discovered organism was named Kakabekia. While science buffs will revel in Kakabeka’s ancient geology, fans of myths and legends will love the mysticism that haunts Kakabeka Falls, thanks to the sad tale of Princess Green Mantle. According to Ojibway legend, the princess sacrificed her life to save her village from invading Sioux warriors. Her father, Chief White Bear, had gotten word that a group of Sioux were further up the Kaministiquia and headed toward his tribe’s camp. Green Mantle, worried about her father’s old age and inability to ward off the approaching enemies, took it upon herself to stop the invasion. She paddled up the river, abandoned her canoe at the foot of the Great White Falls, and hiked to the Sioux camp. There, feigning that she had lost her way and playing up false fear, she begged for her life in exchange for taking the Sioux to her father. The Sioux took off with Green Mantle as their guide, paddling down the Kaministiquia—and straight toward death, with the princess leading her enemies right over the Great White Falls, and dying herself so that she could protect her father and people. It’s said today that you can see the figure of Green Mantle in the mist that rises up from Kakabeka Falls. Science and mysticism aside, Kakabeka Provincial Park is also just a lovely place to set up camp and explore Northern Ontario nature. 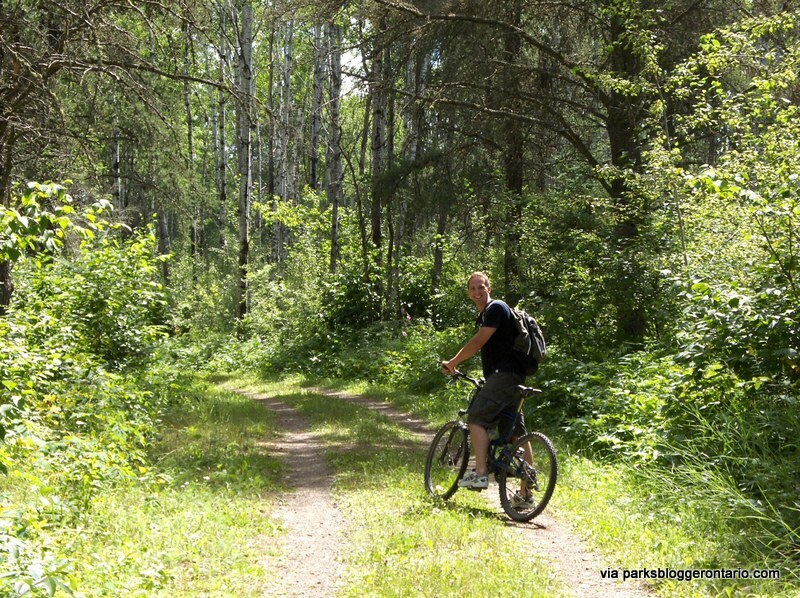 Hikers and cyclists (and in the winter months, cross-country skiers) will find several short trails around the grounds. The longest, Poplar Point Trail, is a moderate-level loop of four kilometres that weaves along a dirt track, with the option to add on the 4.5-kilometre Beaver Meadows and 3.5-kilometre River Terrace cross-country ski trails. A shorter, but more difficult route, is the 2.5-kilometre Little Falls Trail, which descends steeply into the river valley. 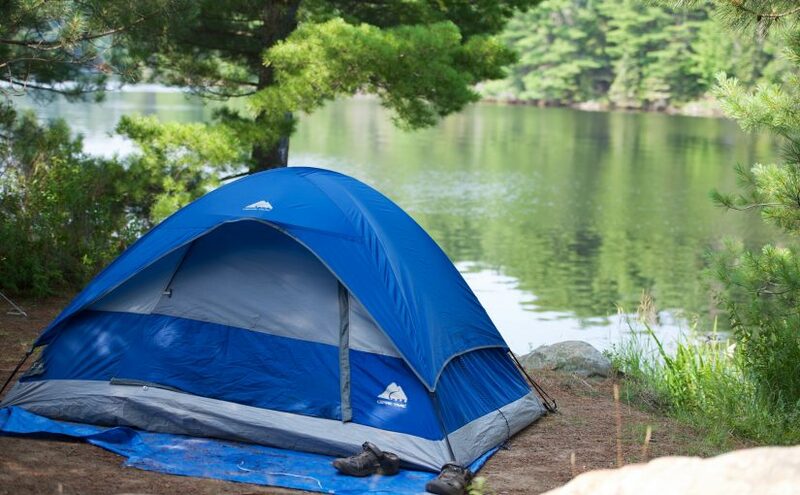 For campers, sites are available with the option of electrical hook-ups. As well, showers, flush toilets and coin laundry facilities are available on the grounds. Swimming is permitted in a sheltered area upriver from the falls. Note, however, that the beach is susceptible to fast currents; as well, water levels on the Kaministiquia are controlled by Ontario Hydro and can fluctuate. Summer education programs are also available, offering interactive sessions on the region’s history, wildlife, flora and geology. 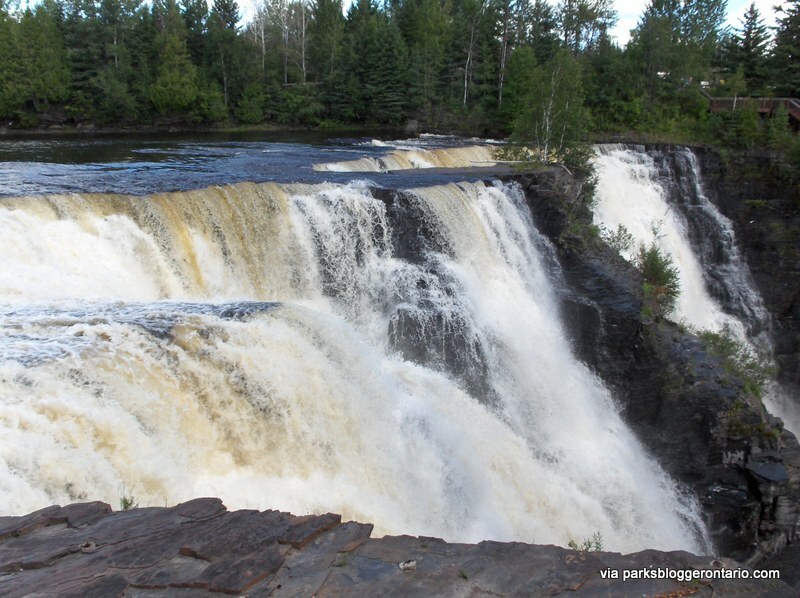 For more information on Kakabeka Falls, visit the Ontario Parks Kakabeka Falls Provincial Park webpage. By Tammy Burns, a Toronto-based writer and editor with a nomadic heart. A lover of travel narratives and getting lost wherever she goes, she writes about travel and the travel journalism industry on her blog http://anywhereandhere.com. Follow her @BurnsTammy. I just found out about Kabeka Falls. I am wondering if there is good fishing in the area and if so what kinds of fish. Intersts also include scenic vistas, camping. outdoors activties. My husband has just told me that Larry’s baits started from a. Very little ice shack….my husband can’t remember the year he is thinking 1998 because he lived with his sister there and she had pass away in an car accident they had hit a moose heading to sault ste marie…. So just asking about the little shack….thank you so much….